Mid-cycle update yields torquey new turbo engine shared with CX-9. 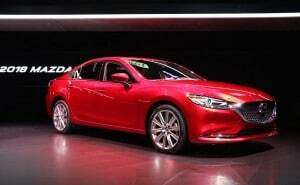 The new Mazda6 unveiled at the LA Auto Show borrows some style cues from the Mazda Vision concept. For a mainstream automaker, Mazda officials spend a lot of time talking about “premium” vehicles lately. And a close look at the mid-cycle update of the brand’s midsize sedan helps put that into perspective. The latest-generation Mazda6 wins kudos as one of the most attractive vehicles in its segment, and the 2018 update bumps things up a notch, picking up on some of the cues from the recent Mazda Vision concept. There are also a number of interior changes, with details like Napa leather and even real wood trim on the top-line version of the 2018 Mazda6. But there’s more to the story. In Mazda’s case, “premium doesn’t mean premium pricing, but a premium bond with your car,” explained Masahiro Moro, president of Mazda’s U.S. operations, during a preview at the Los Angeles Auto Show. The new Mazda6 continues to play on the characteristics that keep Mazda buyers loyal. Surprisingly, at least for Mazda, there’s no stick shift, just a six-speed automatic driving the front wheels of the Mazda6. The more plebian alternative is the current, 2.5-liter naturally aspirated four making 184 hp and 185 lb-ft of torque. Sadly, at least for enthusiasts, this is the only way to get a six-speed manual, or the same six-speed automatic. 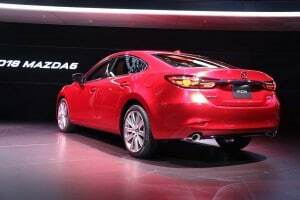 To enhance overall driving pleasure, Mazda has returned the suspension on both versions of the Mazda6. It also claims to have taken steps to improve NVH, or noise, vibration and harshness, by adding a thicker floor pan, new door seals and making other tweaks to the platform, body and powertrain. The Mazda6 offers buyers a premium experience without the premium price tag. While the exterior changes are modest, the interior definitely does get a more premium feel, especially in upper trim packages. It’s not just the addition of things like Napa leather, wood and suede, but the Japanese Takumi-style details, such as hand-stitching. Meanwhile, controls, especially from the HVAC system, have been regrouped to make them easier to see and use. 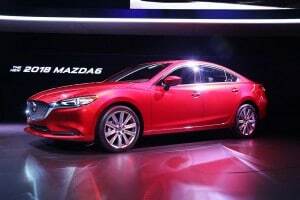 Mazda isn’t ready to reveal pricing on the new Mazda6. We’ll have to wait for that until closer to the mid-cycle update’s on-sale date in spring 2018. This entry was posted on Thursday, November 30th, 2017 at and is filed under Automobiles. You can follow any responses to this entry through the RSS 2.0 feed. Both comments and pings are currently closed.